It’s official: Red Dead Redemption 2 is real, and it’s coming in 2017 (hopefully). Rockstar Games teased fans throughout the week with some cheeky Tweeting, before finally lifting the lid on the industry’s best-kept secret. It’s been a whirlwind year for Red Dead fans. We got the original on Xbox One’s backwards compatibility program, which certainly reignited interest in one of last generation’s best games. There were also questions as to what Rockstar’s next project would actually be, with the studio having focused on GTA Online over the past few years. Comparative to last generation, this console era has been a quiet one for Rockstar, as we’re yet to see a new game from the company. That points to Red Dead Redemption 2 being pretty special. It’s obviously been cooking in the oven for a while now, and there’s no doubting Rockstar’s ability to evolve and improve upon its games. Just look at the jump from San Andreas to GTA IV, and then even from GTA IV to GTA V. It somehow managed to improve upon the perfected. At the heart of any good Rockstar game is the game world and map. Part of what made Red Dead Redemption so amazing was its ability to utilise space so effectively: even with so much barrenness, the map was able to produce surreal beauty that pushed the player towards the objective. Many open-world games either over-compensate and saturate areas of the map, or leave areas empty and lifeless. Red Dead Redemption‘s map was large, barren and rough, yet strangely inviting. Considering the seven-year gap between Red Dead releases by the time Red Dead Redemption 2 comes out, you’d expect a pretty significant jump in the size, scope and design of the game map. Back in April, a NeoGAF user leaked and then promptly removed a map they claimed to be from Red Dead Redemption 2. 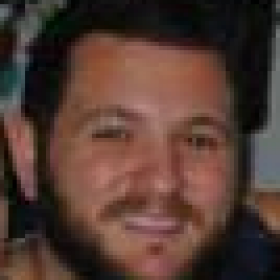 The leak was backed up by Tech Radar, which cited insider knowledge of the map as confirmation that it was real. A mere six months ago, and 18 months ahead of Red Dead Redemption 2‘s planned release, this map was considered to be a “very recent” art direction for the game’s world (click image for high-res version). So what does this map tell us? A few things. 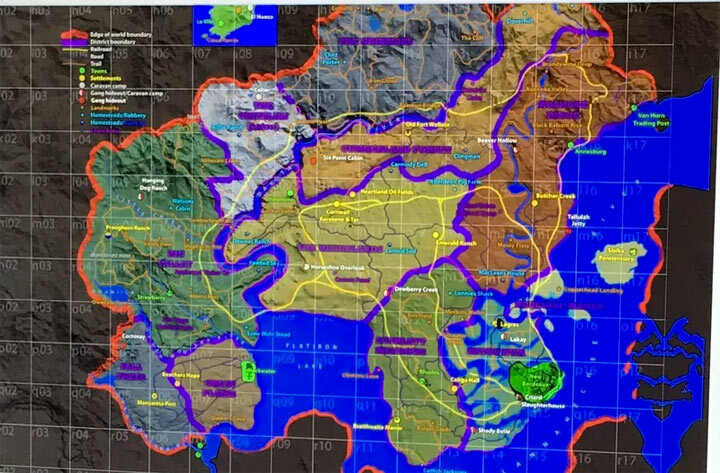 Assuming that the world is the same as the one set in Red Dead Redemption (and not a reimagining ala. Los Santos and San Andreas in GTA V), then this map is set to the north-east of the original game’s setting. We can gather this based on the location of the Great Plains, which is located to the south-west of the map. In Red Dead Redemption, the Great Plains was north-east. Let’s compare the two maps. 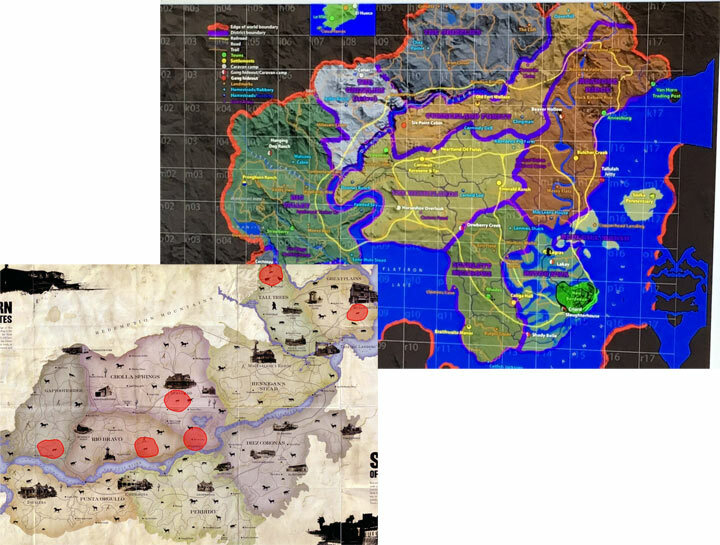 As you can see, it’s pretty clear that the maps match up, and that the leaked map is representative of the north-east section of Red Dead Redemption USA. 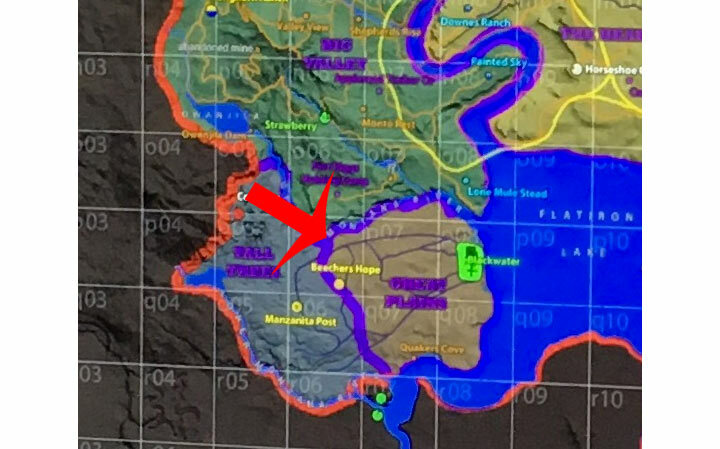 We can gather a few others things from this leaked map. For one, the Great Plains in the leaked map don’t appear to have a railroad. There are also camping caravans scattered throughout the lands. Both of these suggest that the setting is a prequel, set in the past before Red Dead Redemption. Whether or not that is to feature John Marston (as I mentioned here), is of course still a mystery, but if this game were to be a prequel, one would imagine Rockstar would bring back one of its most popular characters in a leading role. That’s right: in the bottom right corner, to the south-east of the map, is New Bordeaux, which was the city setting for Mafia 3. That game was of course published by 2K Games, which is, like Rockstar Games, a subsidiary of Take-Two. The fact that the city is circled and emphasised suggests it could be a major hub in the game. That’s all we know about Red Dead Redemption 2‘s map for now, and we won’t know more until the game is actually released in late 2017. Until then, hang tight and look out for the first official trailer, which is set to hit at 2am AEDT on October 21.